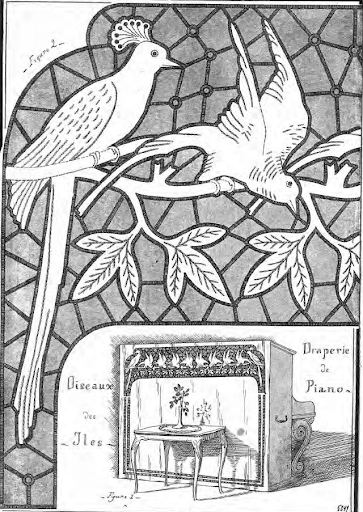 This is a free book from Paris, 1925. It’s another find in the Antique Pattern Library, and its focus is cutwork. 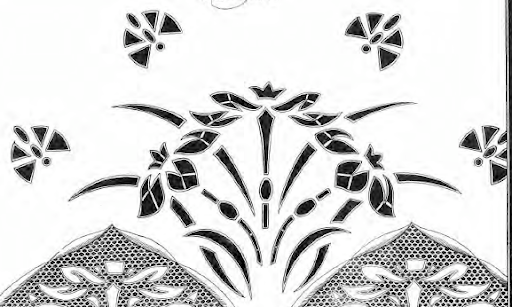 Not that you have to do the designs in cutwork. 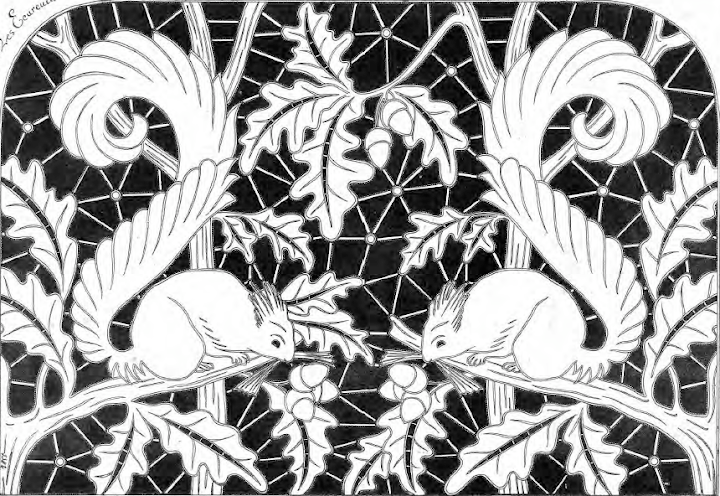 I haven’t tried cutwork yet, but one of these days I will. My understanding is that all you need for even the most complex design is running stitch, buttonhole stitch and the ability to be very careful with scissors. The third requirement might disqualify me though. An explanation for how to do it is found at Needlework Tips and Techniques, and I found an extra-detailed explanation of buttonhole bars on Sarah Whittle’s blog. There are a lot of medieval scenes, like this noble lady, various hunting scenes, St George slaying the dragon, and so on. A few scenes are Egyptian hieroglyphics style. Some of the designs are mostly eyelets and smaller holes with few buttonhole bars, like the flowers and skates below. Finally, I’ll wrap up this review with a really complex design of two squirrels. If I worked it, I’d revise it to involve fewer bars. Goodness gracious. 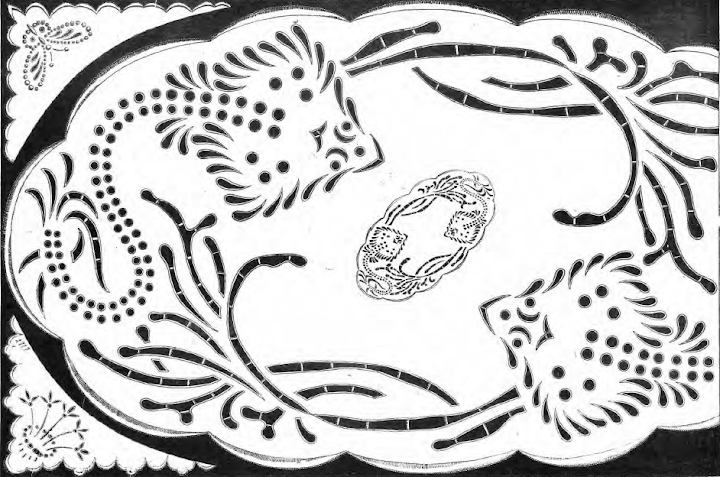 If you’re interested in yet more cutwork designs, there’s a review of a book of fables illustrated with cutwork patterns (available free at the Antique Pattern Library) at Needle’n Thread. 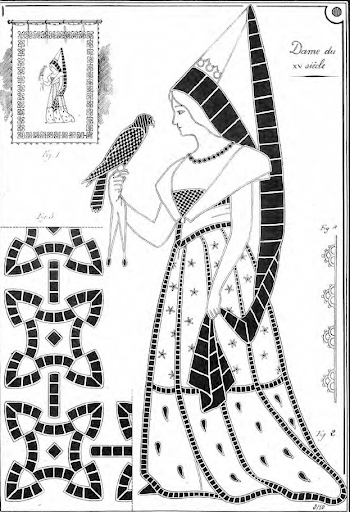 This entry was posted in Cutwork, Free resources online, Historical, patterns and designs and tagged cutwork, embroidery, free books, French, historical. Bookmark the permalink. Thanks so much for linking to Needle ‘n Thread! I love cutwork! And those squirrels are TERRIFIC, aren’t they? They look like they’d be fun to do! !…… though I have a feeling the connections might drive me batty before all was said and done! And then there’s that whole question of the cutting part…. Thanks, Mary. Glad you like my post. I’m delighted with this book! I embroidered one curtain according to the drawing from this book.